New Line Theatre | and sure stars shining . . .
Judy Newmark of the Saint Louis Post-Dispatch named me Best Musical Director in her Judy Awards last week. I’m delighted! And I knew Judy had really enjoyed The Sweet Smell of Success at New Line Theatre in June, but I did not realize how much . . . . This entry was posted in Daily Life, Musical Theatre, Shows and tagged Judy Awards, New Line Theatre, Saint Louis Post-Dispatch on January 3, 2018 by Jeffrey Carter. We run for two more weekends, Thursday through Saturday! Jeffrey Richard Carter’s musical direction really brings the score to life in dynamic and expressive fashion, aided by a crack band that includes: Carter (piano), Kaela Barnett (trumpet), Sue Goldford (keyboard), Steven Johnson (reeds), Clancy Newell (percussion), and Jake Stergos (bass). …the excellent band led by music director Jeffrey Richard Carter, bringing the show’s jazz-influenced score to life with a bold attitude and style. Musical director Jeffrey Richard Carter makes the show positively sweat the grime of New York’s nocturnal underbelly. …musical director Jeffrey Richard Carter keep the show moving at a brisk pace. The songs are sharp and well executed . . . .
That mood is established from the get-go by music director Jeffrey Richard Carter and the New Line Band. They sound as if they’re appearing at the Marcelle via time travel, on loan from a midcentury hot spot in Greenwich Village. The music is jazzy, but I wouldn’t think particularly easy for the always excellent New Line Band: Jeffrey Richard Carter conducting Kaela Barnett, Sue Goldford, Steven Johnson, Clancy Newell and Jake Stergos. There seemed to be a lot of starts, sudden breaks, key changes—the music was almost a speaking part in and of itself. It set the tone . . . .
And how tight the jazzy noir score is by MARVIN Freakin’ HAMLISCH, with crisp music direction by Jeffrey Carter (band includes ace Sue Goldford). Smooth intricate orchestration – love those horns! 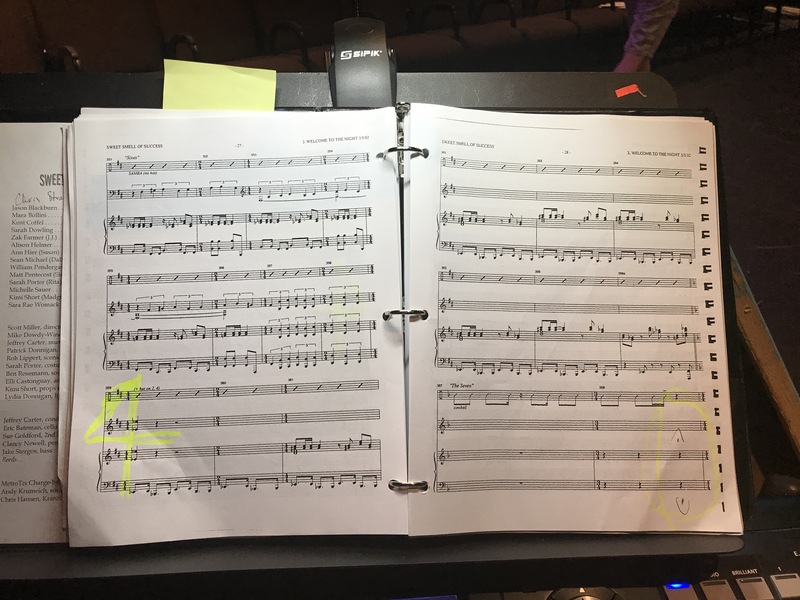 This entry was posted in Daily Life, Musical Theatre, Shows and tagged New Line Band, New Line Theatre, The Sweet Smell of Success on June 11, 2017 by Jeffrey Carter. A day in the life. Three different hats, each of them delightful and satisfying. Morning. Final audition day at Webster University. Meet and greet ten students who wish admission to the Department of Music’s various majors. Hear auditions, and meet with various faculty. Afternoon. At home for 3.5 hours of voice lessons, and some real success in making modifications in tonal quality and breath management. I love teaching voice, and am delighted for the six new private-studio students who started lessons recently. Evening. At New Line Theatre. Opening night of The Sweet Smell of Success. Black clothing but warm hearts as I lead the ensemble in this witty, wicked show. 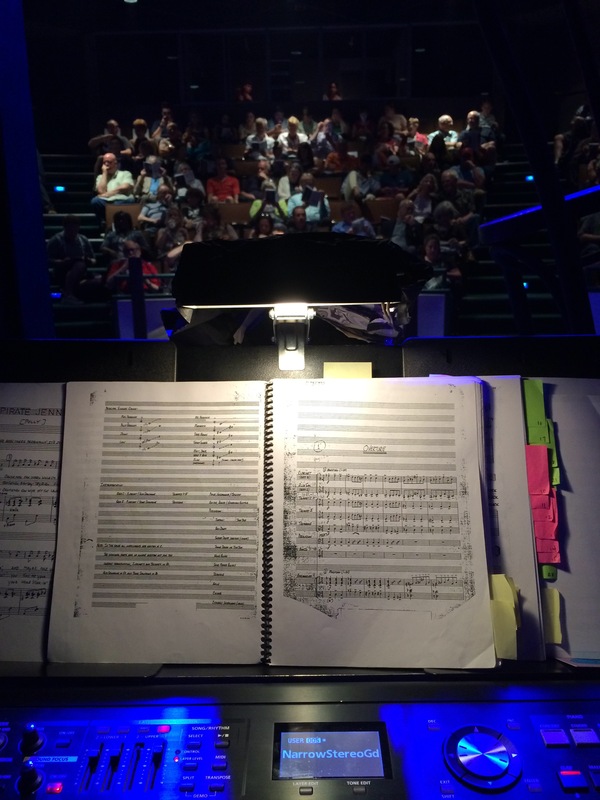 This entry was posted in Daily Life, Musical Theatre, Shows, Song, Uncategorized, Webster and tagged musical theatre, New Line Theatre, voice lessons, voice studio, Webster University Department of Music on June 3, 2017 by Jeffrey Carter. That will be a full day off from the office! This entry was posted in Daily Life, Food, Webster and tagged Cap'n Crunch, New Line Theatre, raspberries on June 15, 2015 by Jeffrey Carter. Our second weekend of New Line Theatre‘s The Threepenny Opera is nearing a close. I’ve grown to love this show so much! The reviews have been strong, although the audience may or may not be ‘getting it.’ We are having fun with this material, and the band sounds better and more idiomatic every night. And I delight in having one of my own voice students in the show. –And a top notch band led by Jeffrey Richard Carter. –As usual, an excellent band led by Music Director Jeffrey Richard Carter. –A 7-piece house band handles the score with elan. –Jeffrey Richard Carter’s (piano/conductor) musical direction is finely honed. –The moment music director Jeffrey Richard Carter and his sly ensemble begin the overture, a shudder of pleasure rips through the theater. –Musical director Jeffrey Richard Carter leads his excellent band through the song’s sea-shanty rhythms with malicious glee. It’s a beautiful start to the evening. For the next three weeks you have a choice in how you stay informed about current events: You can either suffer through another local newscast as the tone whiplashes between banal levity and grim images of oppression, crime and human misery — or you can soak up the horrible truth at New Line Theatre’s near-perfect production of The Threepenny Opera. Bertolt Brecht and Kurt Weill’s assault on society’s ills was crafted as Germany started its long slide into Nazism. Poverty was grinding down the middle class, killers stalked the streets, and the government twiddled its thumbs while the ultimate evil grew in strength every day — and good men did nothing. We all know how that turned out, so why are we making the same mistakes 87 years later? That is the question haunting almost every lyric Brecht wrote for Threepenny, and it is that question that director Scott Miller has his cast hammer home throughout the show. The result is a sharp, angry musical that shouts the truth about our society’s ills for two-and-a-half hours. If you’re not angry by the time the lights come up, you’re part of the problem. This entry was posted in Musical Theatre, Shows and tagged New Line Theatre, orchestra pit, Threepenny Opera on June 6, 2015 by Jeffrey Carter. This popped up on the New Line Theatre Facebook feed today — a little panorama from opening night. I’ll take one this evening, from my perch in the orchestra hovel underneath the stage. This entry was posted in Daily Life, Shows and tagged New Line Theatre, Threepenny Opera on May 30, 2015 by Jeffrey Carter.